Thrift-store tablecloth turned play room curtains. Huzz. The sky is bright and it finally feels safe to consider (without threat of stone-cold disappointment) that spring is heading our way. Officially. So I'll keep this short. Place Beyond the Pines finally landed in our local theater this weekend. Sarah and I made last-second plans to go. Ryan Gosling + Bradley Cooper. Enough said? Help me Rhondas, it did not live up to its potential. But let's focus on the positives: 1) BC appears to have located and bathed in the fountain of youth. He honestly looked like he was 19. It was...disconcerting. 2) RG can look any crazy way, but that voice is always the same and every character he plays retains just enough of that RG-ness to affirm that he truly is the man for the Hey Girl movement. 3) Eva Mendez. I love this girl. I like her boxy teeth. He skin glows like something wonderful, such as maple syrup. She looked vaguely Native American in this roll. Perfection. In a nut-shell, I feel warranted in summarizing the entire movie with just one keen observation: Never end up on the wrong side of Ray Liotta. As for today, we have nothing planned. SCORE! Better get to it. 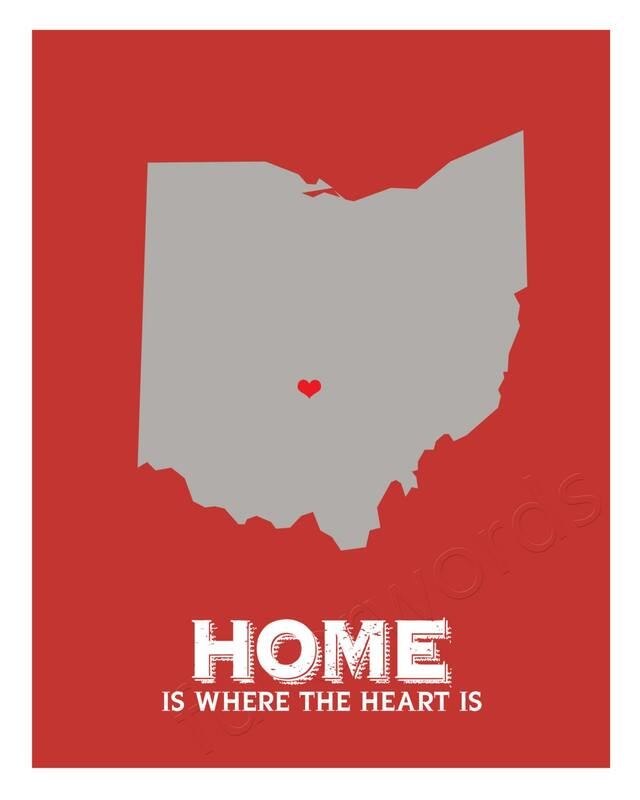 Really crushing on this "Home State" print by Fuller Words. Watercolor Wallpaper by Little Green Notebook I find myself thinking about wallpaper again for another little nook. Hate me, Cory. Call me crazy, Dad. I know I said I would "never". But a girl reserves the right to change her mind. I made the mistake of pretend shopping at Anthro last week and now I'm intrigued by this T (we all agree that I'm painfully predictable, yes?) and this (in gray). Also this muumuu speaks to me in a strange and wonderful way. Thinking About Our Garden by Under the Sycamore We're garden planning today and this post is full of happy inspiration. Hope by 70 Piggies My pal Nicki writes in beauty and truth. She understands small and large places inside my heart like no other. Her words pull me further into the heart of my maker. Her family is getting ready to trek off to Kenya later this summer. They're resting in hope smack-dab between the places of "Let's pack our bags!" and "We need to raise the rest of our funds." This post gives us a glimpse of what it looks like to throw ourselves off the cliff in reckless obedience. For Days When Marriage Feels Impossibly Hard by Stanley Clan So, Becca. We sort of live parallel lives. Homegirl wrote this piercing post and it stayed with me for days. Here's to shucking our protective coating and resolving to live transparently. None of our lives are without heartache and confusion. It can be beautiful to talk about it. Where is the Mommy War for the Motherless Child by Rage Against the Mini Van Okay, this is an oldie, but I don't think I've shared it? It slayed me. To the bone. Motherhood for the Introvert by Chatting at the Sky And while we're in flash-back mode, this post lingers in my mind so often. And...it was written in 2009. Heyyyyy, Emily! See what your writing does to me? Grabs hold. Doesn't let go. Hearts by Nester I believe that sponsoring a child in a 3rd world country is just sort of not-optional. For one thing, the need is just too great for us to decide that we don't have to play. For another, our hearts need one or four or ten of them banging around in there. and happy weekend to you, girlie-gal. i'm utterly basking in this sunshine and warm weather. here's to hoping it'll be here to stay!! wondering if you were contemplating an allegan antique market trip this weekend?? my friend, mindy, really wants me to go with her. if i do break down and go, i'll keep my eyes out for ya! We talked about it and I want to SOOOO bad, but we're doing prison run. :) Next month?? We def need to plan to meet up! Did you notice the wall paper in the nursery photo that the strips of paper weren't matched? Weirdness. That movie looked creepy to me anyway. Thanks for the heads up! These links are fabulous, thanks for sharing them!! And what gorgeous curtains -- that's thrift store magic right there. I want to see that movie! My hubby and I talked about it yesterday but landed on seeing 42 instead. Now to check out your links! AHHHHHHAHAHAHA! Never end up on the wrong side of Ray Liotta. HAHAHAHHAHAHAH! I mean, I want to cross stitch that onto a pillow and give it to my husband on his birthday. You're quotable my friend. I mean, cross stitch pillow quotable. have i told you lately that i love you? (you know it's serious stuff when i channel rod stewart.) God plastered you all over my mind this morning, so i've been praying. i reckon He's got some glorious/crazy things in store.